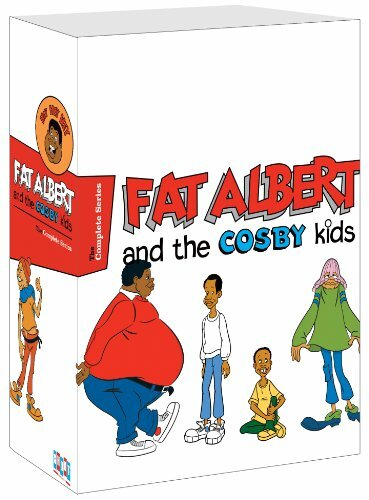 This 16-DVD box set features nearly 40 hours of content, including all 110 episodes of Fat Albert and the Cosby kids (36 episodes), The New Fat Albert Show (24 episodes) and The Adventures of Fat Albert and the Cosby kids (50 episodes), of which seasons 2 - 4 have never before been released on DVD before. Special features include commentary and a documentary on the history of Fat Albert by Bill Cosby and a 20-page book featuring an essay by Dr. Gordon Berry, the show's educational advisor. Los Angeles, CA (April 11, 2012) - Hey Hey Hey! Shout! Factory today announced that Fat Albert And The Cosby Kids: The Complete Series is coming to DVD on July 31, 2012! This 16-DVD box set features nearly 40 hours of content, including all 110 episodes of Fat Albert and the Cosby kids (36 episodes), The New Fat Albert Show (24 episodes) and The Adventures of Fat Albert and the Cosby kids (50 episodes), of which seasons 2 - 4 have never before been released on DVD before. Special features include commentary and a documentary on the history of Fat Albert by Bill Cosby and a 20-page book featuring an essay by Dr. Gordon Berry, the show's educational advisor. The Fat Albert and the Cosby kids programs were created, produced and hosted by legendary comedian Bill Cosby, who also voiced several of the characters. The show was a staple of Saturday mornings on CBS, premiering in 1972 and running until 1985. The series was based on Cosby's childhood memories and friendships, focusing on the lovable Albert Jackson and his signature salutation "Hey! Hey! Hey!" Fat Albert and his friends had positive attitudes and were eager to learn, all in spite of their apparent poor economic conditions. Fat Albert and the Cosby kids had a powerful impact on children across the country, entertaining millions of kids and families alike while always fostering lessons in life, which were reinforced by Cosby's live-action hosting segments. The show has a special place in television history, and today Bill Cosby, Fat Albert, Rudy, Weird Harold, Mushmouth, Dumb Donald, Russell and the Brown Hornet remain beloved by fans all over the world. Comin' at you with music and fun! One of America's longest running Saturday Morning TV cartoons, Fat Albert and the Cosby kids(TM) follows the adventures of a group of resourceful and unpredictable city kids growing up in the 1970s. The series features daily life lessons as they're learned by Fat Albert and his friends, Weird Harold, Rudy, Dumb Donald, Russell, Bucky and Mushmouth. Renowned comedian Bill Cosby created these unforgettable characters based on his own childhood experiences. And if you're not careful, you may learn something before it's done!